We’re thrilled to confirm another fantastic benefit of being an Annual Pass holder - complimentary Visitor Parking! 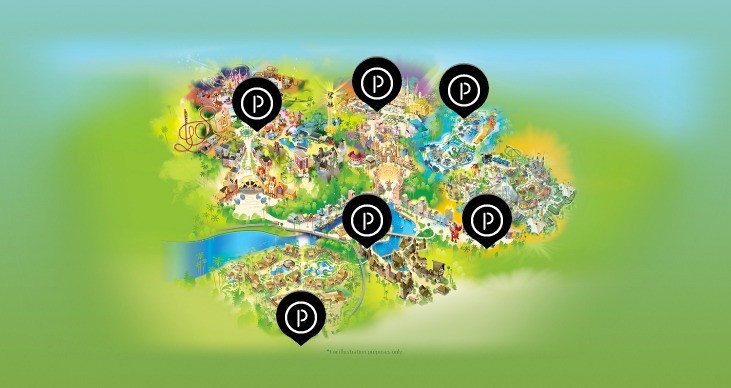 All existing annual pass holders and all annual passes, will now enjoy FREE Parking at the visitor parking at Dubai Parks and Resorts. Simply show your Annual Pass at the Visitor Parking entrance, and enjoy all day parking access, throughout the year. Please note, this offer is only valid at Visitor Parking. Valet Parking are available for a fee in VIP Parking. Amazium Plaza – closest access to MOTIONGATE™ Dubai and Bollywood Parks™ Dubai, via the Boardwalk. Should make their way to the Bus and Taxi Center located next to the Riverland French Village and arrivals plaza. Vehicle Assistance - If you should experience car problems while visiting Dubai Parks and Resorts, battery jump starts are provided as a courtesy to our guests. If additional aid is required, raise your vehicle’s hood if possible, and report your vehicle's location to any parking attendant for assistance. RESORT HOTEL: Valet parking at Resort hotel is complimentary for Lapita Hotel guests. Guests with mobility disabilities—including those traveling with personal wheelchairs, electric scooters or other mobility devices—should utilize the VIP Car Parks disability section, located a short distance from the Main Entrance of RIVERLAND Dubai. Please note that courtesy trams are not needed, and therefore do not serve these locations. For further directions on parking options, Guests should call Guest services at 800 AMAZING (2629464) International: +971 4 820 0000.